Mount Ku-ring-gai to Apple Tree Bay. Mount Ku-Ring-Gai to Apple Tree Bay snapshot. Mount Ku-ring-gai to Apply Tree Bay. The Mount Kuring-gai to Apple Tree Bay to Bobbin head bushwalk has plenty to offer. Access to the trail head is easy via car or a train to Mt Ku-ring-gai station. The first half of the track is a descent down to Cowan Creek. The views of the creek are excellent as you make your way through granite boulders in a typically Australian bush setting. Once down at water level make your way along the creek to Apple Tree Bay. A short distance further is the Bobbin head cafe which is a great place to grab a bit and enjoy the views before tackling the trek back up Mt Ku-ring-gai. All up a great hike which a highly recommend. Directions to Apple Tree bay bushwalk. Google Map Link. Drive to the end of Harwood Ave or catch a train to Mt Ku-ring-gai station. At the start of the track you’ll see a sign say “Mt Kuring-gai Track”. Apple Tree Bay Trail Map. Apple Tree Bay Photo Gallery. Apple Tree Bay Youtube Clip. 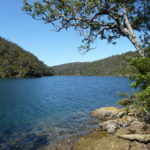 Bushwalking north Sydney, Ku-ring-gai bushwalks, Mount Kuring-gai, apple tree bay, bobbin head, tracks, trails, hike, trek.